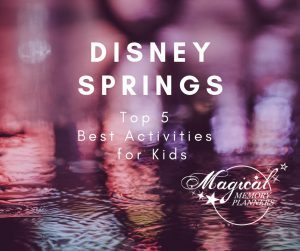 Maybe you are at Disney Springs as part of your Disney vacation or maybe you are in Orlando for other reasons and looking for something to do with the kids. Here are our best ideas that your kids will enjoy. Who doesn’t love a ride on the carousel? This Venetian carousel is located in the center of the Marketplace section of Disney Springs. There is a small fee to ride and the carousel runs from about 10am to 11:30pm daily. It can be a fun ride for the kids (kids and kids at heart) and can be a great break from shopping. After a ride on the carousel you might want to take the kids for a ride on the train. This ride is best for children since the trains are small. There is also a small fee to ride and the train also runs from 10am to 11:30pm daily.